Catalonia’s deposed president Carles Puigdemont arrived in Scotland on Friday, in his first trip abroad since he returned to Belgium after a four-month stay in Germany, after a Spanish court dropped a European arrest warrant for him. The Catalan former president sought refuge from the Spanish justice in Belgium last October after holding an independence referendum and promoting a declaration of independence, passed in the Catalan Parliament on 27 October 2017. Puigdemont announced on Twitter he was in Scotland on Friday evening in order to take part in the international diplomatic forum Beyond Borders, held this weekend in Edinburgh. ‘He landed in Edinburgh from Brussels on Friday afternoon,’ Catalan’s regional government, which had kept the visit secret, confirmed in a statement. Puigdemont will take part in the Beyond Borders forum on Sunday at the invitation of its organisers, the statement said. 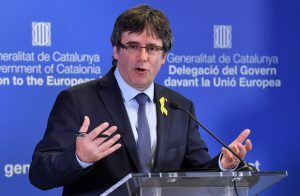 After he was sacked as Catalan president by Spain’s central government under the former Prime Minister Mariano Rajoy, and following the application of article 155, Puigdemont and several members of his executive fled to Brussels several days later. Puigdemont returned to Belgium when Spain’s Supreme Court dropped the arrest warrant in late July. ‘We resume the international activity in order to fight for the freedom of the Catalan Republic,’ said Puigdemont on his Twitter account.